I was off on vacation for awhile there and now I'm back to work. Ugh! But, during my work hiatus I managed to do some creative stuff. 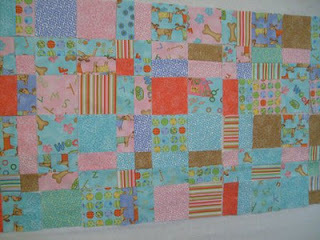 There was quite a bit of sewing while I made more of my scrap blocks. Does anyone else feel like they sit at the seewing machine for hours making these things and at the end of the day the scrap pile hasn't gone down at all??!! I guess part of that is because I started other projects which resulted in . . . you guessed it . 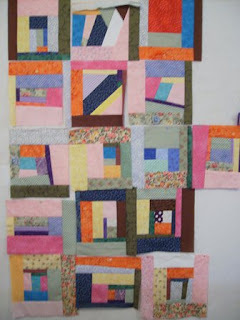 . . more scraps!!! Yikes! If only these little scraps could mate at night and then I could get up in the morning and just press them and quilt them!! Ah, heavy sigh, I guess I'll just keep plugging along. 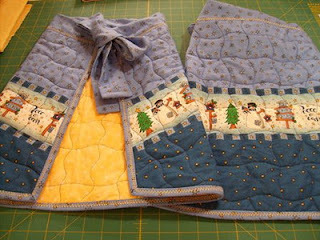 Next up was some Christmas fabric that I quilted and turned into these little lovelies. There were potholders to match, but it looks like I failed to take pictures of them! I'm in love with the quilted feel of these aprons. It's like being wrapped in some warm, comforting goodness. 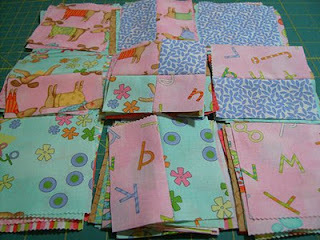 Next up was the pile of scrap charm pack squares. What to do . . . what to do . . . ??? I'd never done a D4P so I decided to tackle that and see where it left me. Right now these squares are just thrown up on the design wall and I'm thinking I'll add some soft yellow sashing between the sections of this quilt to make it grow!! 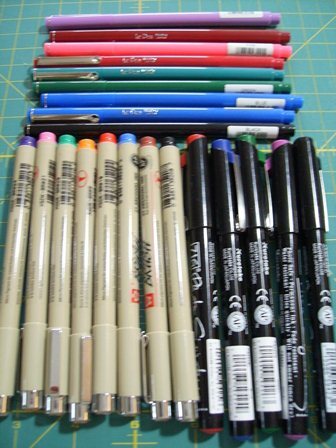 And to add some variety to the creating craftiness, I splurged and purchased some new wonderful pens for my journaling and envelope projects. There was some more creating, but it's for a gift and so I'll wait until the big reveal to show you that project. And last, but not least . . . Love it!!! The bag is FULL!! 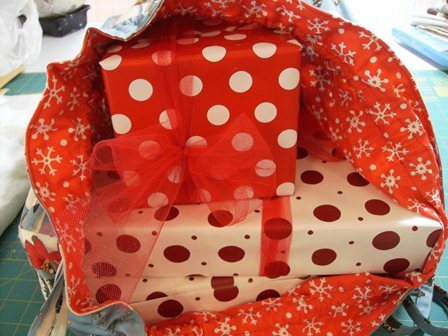 Donna and I will be meeting next week to have dinner and open up our gifts. It's going to be so much FUN!!! Stay tuned for the upcoming pictures of all our goodies . . .
Donna also awarded me the Liebster award a couple weeks ago. I've been remiss in acknowledging this. 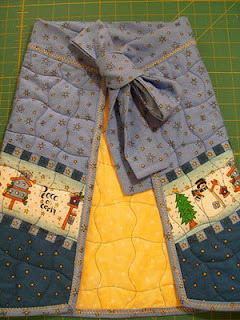 So, please go visit Donna at her cute blog, Donna's Lavender Nest and leave her a comment or two. I've been hardpressed to find time to visit many blogs these days, so I'm going to hand this award out to those of you who read my blog and also have a small following. Keep up the GREAT work. As long as you continue to love it and are inspired, there's no reason to stop. 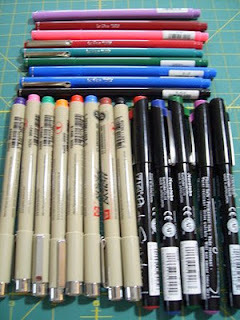 Now, it's time to get back to the crafting . 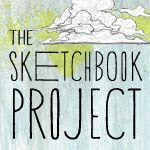 . . hope you're all ENJOYING your creative day!! Looks like the vacations sewing is going hard and fast - good for you! bet you can't wait to rip open those parcels - I can't wait til you do either - photos please! WOW Joyce... you've been busy!!! Next week eh? How many more sleeps...lol! Always Something . . .